So much is written about the luxury that grandparents have in their ability to spoil their grandchildren. Ironically, that tradition been compounded in contemporary society because of our high divorce rate, which, arguably, has reached epidemic proportions. One of the by-products of America’s high rate of fractured families is the fact that now, instead of having two sets of grandparents to shower gifts upon their progeny, children sometimes find that they have four sets of grandparents readily opening their wallets for birthday and holiday giving. Why, we ask ourselves, does every child under the age of 13 need to have his/her very own room, TV, cell phone, X-Box, tablet, laptop, etc., etc., etc.?! To attest to the fact that this phenomenon is not an anomaly, stop and ask yourself how many families with young children within your family/friends circle fit this description. But more, how often and how deeply have you yourself been caught up in this frenzy to give your grandchildren the latest gizmo of the year, regardless of the cost, while privately shaking your head in dismay and disapproval of what you have been an accomplice to? This past holiday I reached the brink of despair when one of my friends’ grandchildren casually stated, “Christmas is all about money.” Neither he nor his brothers have any historical or spiritual perspective on the meaning and purpose of Christmas. It’s all about making sure that they receive everything on their list, which I have noticed has become increasingly more lavish each year. The teenager wanted and expected not one, not two, but three different guitars – each one costing a few hundred dollars. After all, he ‘needs’ an electric, a bass, and an acoustic guitar. Sadly, and through no fault of his own, his parents have neglected to instill any awareness or appreciation for the meaning of Christmas; nor have they let slip the fact that they are both struggling financially, and will assume unnecessary added debt to satisfy his request. Meanwhile, his little brother only wants a tablet, his own 32” tv, the latest X-Box, and numerous video games to entertain himself. How can we, the Boomer generation who became the poster children for rampant consumerism, reverse this ‘give me’ culture with that we are unfortunately impregnating our grandchildren? How do we stop buying in to the annual ‘buy everything’ frenzy that seems to begin earlier each year and to accelerate in dollars? Do we even realize and admit that such consumerism is toxic, that it teaches our children false, superficial values, that it negates and obscures the meaning of gifting, that it fosters bad habits within the younger generation and raises artificial expectations? Oh, yes we can! We can and should and, in fact are finding and giving sustainable gifts that keep on giving, treasures that will yield a substantive, long range return on our investment for and in our grandchildren. Such intangible ‘pebble causing ripples in the water’ gifts comprise the stuff of which future family traditions and values are made of. Let’s look at several fantastic, creative, meaningful, long-lasting gifts you can give your grandchildren – non-traditional stuff that you won’t find at the mall, at any box or bargain store or on Amazon.com. Better still, these items of substance won’t end up in the trash bin, in the Good Will store, or be relegated to the dead-end destiny of attic, basement, garage or shed. But you will find them within your family heirloom collection for years, perhaps generations to come. Initially, their gifting won’t empty your wallet or deplete your bank account, but they will become permanent fixtures in your grandchildren’s lives. Nor will you find these ideas and items quickly converted from treasures to trash, relegated to the obsolete, irrelevant junk pile within a few months after they’ve been unwrapped; instead, you will experience their continued presence within family traditions over time. The essence of this type of gift giving resides in the putting forth of items and ideas from within oneself, one’s experiences, one’s values. As such, these gifts are almost limitless in the positive, even life-changing, effect they can have on the recipients, your grandchildren. Grandpa Bill spent almost two decades of his young life out west, where he became an avid hunter and fisherman. Of course, he was caught up in the whole Western mystique, accumulating enough sports paraphernalia to spark any boys’ interest. In particular, Grandpa was proud of his collection of western belt buckles that he would parade out occasionally to admire their unique ruggedness. As he began to share with his grandson stories of his hunting and fishing expeditions, he wondered how Zach would react to receiving the buckles as a ‘special’ Christmas gift. Oh, and let’s not forget the hour that Zach and grandpa spent together on the Web researching the colorful history behind each buckle. In fact, when Zach returned home, he announced that he planned to use some of his Christmas money to buy a small safe to house his newly received treasures. Grandma Ethel has since retired and lives on a fixed income. She can hardly participate in or compete with the material hoopla that every holiday brings. But she does have an incredibly rich childhood past whose memories she wanted to bequeath to her one and only granddaughter Emily, for whom she provides after school daycare. On Christmas morning, amid all the traditional trappings of little girl gifts, Emily found within her stocking a ticket for a Mystery Tour Field Trip. Grandma had included a walk/ride map of historical sites that she and Emily would visit on their full-day excursion. Of course, it included a lunch stop at Emily’s favorite ice cream café! On the day of the field trip, Emily borrowed a family digital camera, snapping photos at each spot along the way. By the end of the day, she had gathered pictures of the former chicken farm homestead, the waterfall where grandma used to swim, and the orchards where grandma, as a young girl, had picked apples, strawberries, and pumpkins. A week later, Emily and grandma sat down together and created a digital photo album, complete with script and music. And that’s not the end of the story! The following week, when Emily returned to school, her Mystery Tour Field Trip was the Christmas gift she chose to present to and share with her classmates. Early on in their marriage, the Ryans had the fortune to meet a young investor who turned them on to the power of compound interest and the potential of the stock market as an income generator/builder. On the advice and under the aegis of their financial mentor, they started small, investing in a modest portfolio of unglamorous but reliable blue chip stocks. Throughout their marriage they had fun watching what started as a tiny nest egg grow into a respectable retirement fund. If only they could instill their successful financial strategies and instincts into their grandchildren. But how could the dull and boring concept of deferring immediate satisfaction for long-term results compete with the shrill here-and-now sensual bombardment of tv ads, mall frenzy, and peer pressure – all beckoning to buy more junk? They had an idea! Early in the year, they purchased shares in two stocks of companies whose products target the early teen market. Over the year, they monitored the stocks’ progress, recording their ups and downs on a simple spreadsheet. When the grandchildren opened their holiday cards, they found a summary of their stocks’ results thus far, with a simple gift explanation. A few days later, grandpa bookmarked and shared a few sites where the grandchildren could go to experiment with various ‘what if’ scenarios of compound interest formulas. Probably the most empowering gift of all is the one that the Martins gave their grandchildren several years ago. From the time the children understood the concept of Santa and Christmas and gifts, the grandparents began a tradition where, each year in early December, the kids would choose from their daily newspaper listing an anonymous needy boy or girl whose Christmas promised to be bare without the generosity of a secret benefactor. Then, with a portion of the money that each grandchild had saved over the year, the Ryan grandparents would go shopping for appropriate clothing and toys for the chosen needy children. It became such an anticipated ritual for both grandparents and children that, even throughout high school, the grandchildren insisted on continuing the tradition, and it’s a toss-up to determine who most enjoy their annual day together – the grandparents or the grandchildren. Yes, we, the Boomer generation who became the poster children for rampant consumerism, can reverse this ‘give me’ culture that permeates our society. We can, in fact, confront and confound head on the addiction to spend and to buy. Grandparents are finding and giving sustainable gifts that keep on giving, treasures that will yield a substantive, long range return on our investment for and in our grandchildren. Such intangible ‘pebble causing ripples in the water’ gifts comprise the stuff of which future family traditions and values are made. Dr. Marie Langworthy is a retired educator and current author/editor. Through her online business, Super Writing Services, she specializes in “writing it right”–the way you, the client, want to say it. 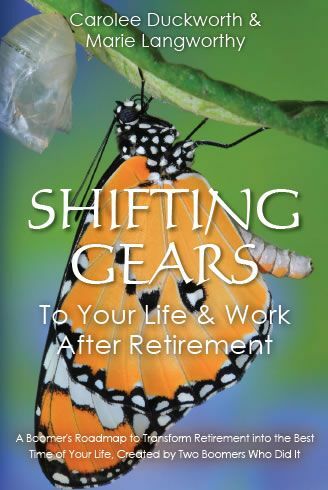 Her recently published book, SHIFTING GEARS to Your Life and Work After Retirement, co-authored with Dr. Carolee Duckworth, is available on Amazon.com and on the Shifting Gears website. 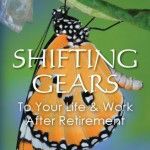 Marie is a contributor to Boomer-related publications, web sites, and blogs, and is available for interviews and workshops on a timely and broad range of Boomer retirement issues.